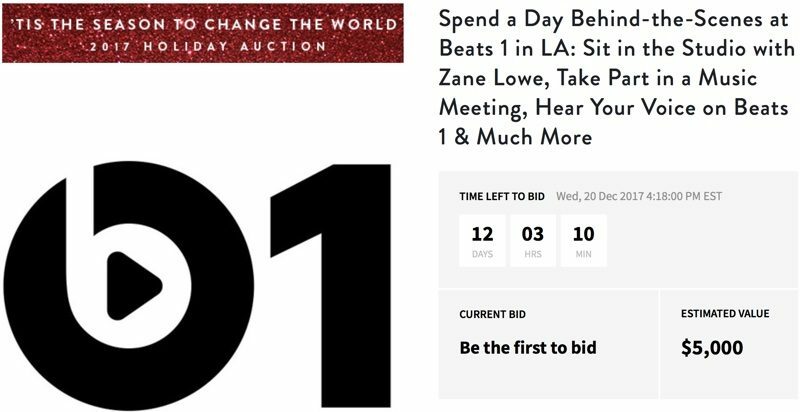 Apple's Beats 1 Radio division is teaming up with auction site Charitybuzz to raise money for MusiCares through an auction that offers a behind-the-scenes tour of the Beats 1 studio in Los Angeles with Beats 1 DJ Zane Lowe. Described as a one-day internship, the auction provides one winner with a full day at Beats 1, as well as access to a few members of the Beats 1 team. In addition to spending time in studio with Zane Lowe, the auction winner will also get to attend a mentoring lunch with Beats 1 Global Operations Manager and LA Chapter Grammy Governer Julie Pilat. - Time in studio with Zane Lowe during his flagship show, which broadcasts Mondays to Thursdays from 9-11am LA time. - Music Business Mentoring lunch with Beats 1's Global Operations Manager & LA Chapter GRAMMY(R) Governor Julie Pilat. - Attend a Music Meeting and discuss the Beats 1 List with the head of Beats 1's Music Team. You'll get to discover the most exciting new music in the world. - Choose a song and play it, live on the radio, during Beats 1 Request. - Hear your voice on Beats 1! Record a voiceover demo with their Production team. - Go home and listen to Beats 1 with a pair of Beats Studio3 Headphones (colors may vary). The person who wins the auction must visit Beats 1 in LA before December 20, 2018. The auction is valid for one person and the winning bidder must personally utilize the award. Transportation and accommodations are not included in the purchase price. Proceeds from the auction, which has an estimated value of $5,000, will go to MusiCares, a foundation run by the National Academy of Recording Arts and Sciences. MusiCares provides resources for musicians in times of need, helping them out in financial, medical, and personal emergencies. Apple has worked with Charitybuzz many times in the past, auctioning off lunches with iTunes chief Eddy Cue and Apple CEO Tim Cook to raise money for charities that include the RFK Center, Autism Movement Therapy, and the National Association of Basketball Coaches Foundation. Dear Apple, stop trying to make Beats 1 happen. How much does it cost to not have to do any of that? Maybe one could ask the Global Operations Manager to play less hip-hop? Thank you. Oh jeez. Are people still peddling this lame assed, ill informed nonsense? Isn’t it happening? Weird that it’s still there, and I still listen to it quite a bit. He is a hugely successful and influential DJ from NZ, who came to Apple via years at MTV and the BBC. He had won numerous awards in the industry, and has songwriting and production credits. If you want to hear the same old classics, there are countless stations out there. If you want something a bit newer, from countless genres, Zane might be worth a listen. 2nd Prize. Two Days With Zane Lowe. Time in studio with Zane Lowe during his flagship show, which broadcasts Mondays to Thursdays from 9-11am LA time. I wonder how much notice you need to give for the day you want to go? Potentially you could end up going on the same day that a major artist is on the show. So you’re not bidding so much to see Lowe, but maybe at a chance to meet your favorite artist. Beats are cheap and sound horrible just my 0.02 cents. Look I don't mean to be a d***, but surely you meant 0.02 dollars? You aren't in accounting, right?